Field-reversed configuration: a toroidal electric current is induced inside a cylindrical plasma, making a poloidal magnetic field, reversed in respect to the direction of an externally applied magnetic field. The resultant high-beta axisymmetric compact toroid is self-confined. A field-reversed configuration (FRC) is a type of plasma device that confines a plasma on closed magnetic field lines without a central penetration. In an FRC, the plasma has the form of a self-stable torus, similar to a smoke ring. FRCs are closely related to another self-stable magnetic confinement fusion device, the spheromak. Both are considered part of the compact toroid class of fusion devices. FRCs normally have a plasma that is more elongated than spheromaks, having the overall shape of a hollowed out sausage rather than the roughly spherical spheromak. FRCs were a major area of research in the 1960s and into the 1970s, but had problems scaling up into practical fusion triple products. In the 1990s it saw renewed interest, and As of 2019[update] the FRC remains an active area of research. The FRC was first observed in laboratories in the late 1950s during theta pinch experiments with a reversed background magnetic field. The first studies of the effect started at the United States Naval Research Laboratory (NRL) in the 1960s. Considerable data has been collected since then, with over 600 published papers. Almost all research was conducted during Project Sherwood at Los Alamos National Laboratory (LANL) from 1975 to 1990, and during 18 years at the Redmond Plasma Physics Laboratory of the University of Washington, with the large s experiment (LSX). More recently some research has been done at the Air Force Research Laboratory (AFRL), the Fusion Technology Institute (FTI) of the University of Wisconsin-Madison, Princeton Plasma Physics Laboratory, and the University of California, Irvine. Some private companies now theoretically and experimentally study FRCs in order to use this configuration in future fusion power plants they try to build, like General Fusion, Tri-Alpha Energy, Inc., and Helion Energy. The FRC is also considered for deep space exploration, not only as a possible nuclear energy source, but as means of accelerating a propellant to very high levels of specific impulse (Isp) for electrically powered spaceships and fusion rockets, with interest expressed by NASA and the media. The difference between a spheromak and a field-reversed configuration is that a spheromak has an extra toroidal field. This toroidal field can run clockwise or counterclockwise to the spinning plasma direction. One approach to producing fusion power is to confine the plasma with magnetic fields. This is most effective if the field lines do not penetrate solid surfaces but close on themselves into circles or toroidal surfaces. The mainline confinement concepts of tokamak and stellarator do this in a toroidal chamber, which allows a great deal of control over the magnetic configuration, but requires a very complex construction. The field-reversed configuration offers an alternative in that the field lines are closed, providing good confinement, but the chamber is cylindrical, allowing simpler, easier construction and maintenance. Field-reversed configurations and spheromaks are together known as compact toroids. Unlike the spheromak, where the strength of the toroidal magnetic field is similar to that of the poloidal field, the FRC has little to no toroidal field component and is confined solely by a poloidal field. The lack of a toroidal field means that the FRC has no magnetic helicity and that it has a high beta. The high beta makes the FRC attractive as a fusion reactor and uniquely suited to aneutronic fuels because of the low required magnetic field. Spheromaks have β ≈ 0.1 whereas a typical FRC has β ≈ 1. The Dimensions of an FRC, including the S-parameter. In modern FRC experiments, the plasma current that reverses the magnetic field can be induced in a variety of ways. When a field-reversed configuration is formed using the theta-pinch (or inductive electric field) method, a cylindrical coil first produces an axial magnetic field. Then the gas is pre-ionized, which "freezes in" the bias field from a magnetohydrodynamic standpoint, finally the axial field is reversed, hence "field-reversed configuration." At the ends, reconnection of the bias field and the main field occurs, producing closed field lines. The main field is raised further, compressing and heating the plasma and providing a vacuum field between the plasma and the wall. Neutral beams are known to drive current in Tokamaks by directly injecting charged particles. FRCs can also be formed, sustained, and heated by application of neutral beams. In such experiments, as above, a cylindrical coil produces a uniform axial magnetic field and gas is introduced and ionized, creating a background plasma. Neutral particles are then injected into the plasma. They ionize and the heavier, positively-charged particles form a current ring which reverses the magnetic field. Spheromaks are FRC-like configurations with finite toroidal magnetic field. FRCs have been formed through the merging of spheromaks of opposite and canceling toroidal field. Rotating magnetic fields have also been used to drive current. In such experiments, as above, gas is ionized and an axial magnetic field is produced. A rotating magnetic field is produced by external magnetic coils perpendicular to the axis of the machine, and the direction of this field is rotated about the axis. When the rotation frequency is between the ion and electron gyro-frequencies, the electrons in the plasma co-rotate with the magnetic field (are "dragged"), producing current and reversing the magnetic field. More recently, so-called odd parity rotating magnetic fields have been used to preserve the closed topology of the FRC. FRC particle trajectory in which a particle starts with cyclotron motion inside the null, transitions to betatron motion, and ends as cyclotron motion outside the null. This motion is in the midplane of the machine. Coils are above and below the figure. FRCs contain an important and uncommon feature: a "magnetic null," or circular line on which the magnetic field is zero. This is necessarily the case, as inside the null the magnetic field points one direction and outside the null the magnetic field points the opposite direction. Particles far from the null trace closed cyclotron orbits as in other magnetic fusion geometries. Particles which cross the null, however, trace not cyclotron or circular orbits but betatron or figure-eight-like orbits, as the orbit's curvature changes direction when it crosses the magnetic null. Because the particles orbits are not cyclotron, models of plasma behavior based on cyclotron motion like Magnetohydrodynamics (MHD) are entirely inapplicable in the region around the null. The size of this region is related to the s-parameter, or the ratio of the distance between the null and separatrix, and the thermal ion gyroradius. At high-s, most particles do not cross the null and this effect is negligible. At low-s, ~2, this effect dominates and the FRC is said to be "kinetic" rather than "MHD." At low s-parameter, most ions inside an FRC follow large betatron orbits (their average gyroradius is about half the size of the plasma) which are typical in accelerator physics rather than plasma physics. These FRCs are very stable because the plasma is not dominated by usual small gyroradius particles like other thermodynamic equilibrium or nonthermal plasmas. Its behavior is not described by classical magnetohydrodynamics, hence no Alfvén waves and almost no MHD instabilities despite their theoretical prediction, and it avoids the typical "anomalous transport", i.e. processes in which excess loss of particles or energy occurs. The tilt and shift modes. Those instabilities can be mitigated by either including a passive stabilizing conductor, or by forming very oblate plasmas (i.e. very elongated plasmas), or by creating a self-generated toroidal field. The tilt mode has also been stabilized in FRC experiments by increasing the ion gyroradii. The magnetorotational instability. This mode causes a rotating elliptical distortion of the plasma boundary, and can destroy the FRC when the distorted plasma comes in contact with the confinement chamber. Successful stabilization methods include the use of a quadrupole stabilizing field, and the effects of a rotating magnetic field (RMF). Field-reversed configuration devices have been considered for spacecraft propulsion. By angling the walls of the device outward, the plasmoid can be accelerated in the axial direction and out of the device, generating thrust. The Electrode Lorentz Thruster (ELF) developed by MSNW was one such device. ELF was a candidate in NASA's NextSTEP advanced electric propulsion program, along with the X-3 Nested-Channel Hall Thruster and VASIMRbefore MSNW dissolved. University of Washington " FRC Introduction"
^ Freidberg, Jeffrey P. (2007). Plasma Physics and Fusion Energy. Cambridge University Press. ISBN 978-0-521-85107-7. ^ Kolb, A.C.; Dobbie, C.B. ; Griem, H.R. (1 July 1959). "Field mixing and associated neutron production in a plasma". Physical Review Letters. 3 (1): 5–7. Bibcode:1959PhRvL...3....5K. doi:10.1103/PhysRevLett.3.5. ^ a b Tuszewski, M. (November 1988). "Field reversed configurations" (Submitted manuscript). Nuclear Fusion. 28 (11): 2033. doi:10.1088/0029-5515/28/11/008. ^ McKenna, K.F. ; Armstrong, W.T. ; Barnes, D.C; Bartsch, R.R; Chrien, R.E. ; Cochrane, J.C.; Klingner, P.L. ; Hugrass, W.W; Linford, R.K.; Rej, D.J. ; Schwarzmeier, J.L. ; Sherwood, E.G. ; Siemon, R.E. ; Spencer, R.L. ; Tuszewski, M. (1985). "Field-reversed configuration research at Los Alamos" (Submitted manuscript). Nuclear Fusion. 25 (9): 1317. doi:10.1088/0029-5515/25/9/057. ^ "Web page of the Redmond Plasma Physics Laboratory". Archived from the original on 2015-02-19. ^ Hoffman, Alan L.; Carey, Larry L.; Crawford, Edward A.; Harding, Dennis G.; DeHart, Terence E.; McDonald, Kenneth F.; McNeil, John L.; Milroy, Richard D.; Slough, John T.; Maqueda, Ricardo; Wurden, Glen A. (March 1993). "The Large-s Field-Reversed Configuration Experiment". Fusion Science and Technology. 23 (2): 185–207. OSTI 6514222. ^ Kirtley, David; Brown, Daniel L.; Gallimore, Alec D.; Haas, James (June 2005). 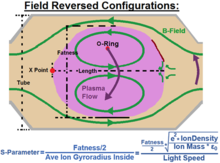 Details on an AFRL Field Reversed Configuration Plasma Device (PDF) (Technical report). Air Force Research Laboratory. ^ "Web page of the Fusion Technology Institute, University of Wisconsin-Madison". ^ "First operation of the PFRC-2 device". Bulletin of the American Physical Society. 57 (12). 2012-10-31. ^ Harris, W.S. ; Trask, E.; Roche, T.; Garate, E.P. ; Heidbrink, W.W.; McWilliams, R. (20 November 2009). "Ion flow measurements and plasma current analysis in the Irvine Field Reversed Configuration" (PDF). Physics of Plasmas. American Institute of Physics. 16 (11): 112509. Bibcode:2009PhPl...16k2509H. doi:10.1063/1.3265961. ^ Poddar, Yash (11 March 2014). "Can Startups Make Nuclear Fusion Possible?". Stanford University. ^ Wessel, F. J. (2000). "Colliding beam fusion reactor space propulsion system". AIP Conference Proceedings. 504. pp. 1425–1430. doi:10.1063/1.1290961. ISBN 978-1563969195. ^ Cheung, A. (2004). "Colliding Beam Fusion Reactor Space Propulsion System". AIP Conference Proceedings. 699. pp. 354–361. doi:10.1063/1.1649593. ^ Slough, John T. (28 November 2000). Propagating Magnetic Wave Plasma Accelerator (PMWAC) for Deep Space Exploration (PDF) (Technical report). MSNW LCC and NASA Institute for Advanced Concepts. ^ Slough, John; Pancotti, Anthony; Pfaff, Michael; Pihl, Christopher; Votroubek, George (November 2012). The Fusion Driven Rocket (PDF). NIAC 2012. Hampton, VA: NASA Innovative Advanced Concepts. ^ Pancotti, A.; Slough, J.; Kirtley, D.; Pfaff, M.; Pihl, C.; Votroubek, G. (2012). "Mission Design Architecture for the Fusion Driven Rocket". 48th AIAA/ASME/SAE/ASEE Joint Propulsion Conference & Exhibit (PDF). doi:10.2514/6.2012-4113. ISBN 978-1-60086-935-8. ^ Slough, John; Pancotti, Anthony; Kirtley, David; Votroubek, George (6–10 October 2013). Electromagnetically Driven Fusion Propulsion (PDF). 33rd International Electric Propulsion Conference (IEPC-2013). Washington, D.C.: George Washington University. ^ "Nuclear Fusion Rocket Could Reach Mars in 30 Days". Space.com. 10 April 2013. ^ Brian Heather (12 September 2013). "Professor John Slough on how nuclear power could get us to Mars in 30 days". Engadget. ^ Dolan, Thomas. Magnetic Fusion Technology. Vol. 2. New York City: Springer, 2012. Print. ^ Ryzhkov, Sergei V. (2002). "Features of Formation, Confinement and Stability of the Field Reversed Configuration" (PDF). Problems of Atomic Science and Technology. Plasma Physics. 7 (4): 73–75. ISSN 1682-9344. ^ Ono, Y (1999). "New relaxation of merging spheromaks to a field reversed configuration". Nuclear Fusion. 39 (11Y): 2001–2008. Bibcode:1999NucFu..39.2001O. doi:10.1088/0029-5515/39/11Y/346. ^ a b Momita Okamoto Nomura (1987). "Advanced Fuels in a Field-Reversed Configuration". Fusion Science and Technology. Retrieved 2016-01-05. ^ Slough, J (2011). "Creation of a high-temperature plasma through merging and compression of supersonic field reversed configuration plasmoids". Nuclear Fusion. 51 (5): 053008. Bibcode:2011NucFu..51e3008S. doi:10.1088/0029-5515/51/5/053008. ^ Taguchi, M (1992-01-01). "Approximate expression for beam driven current in tokamak plasmas". Nuclear Fusion. 32 (1): 143–150. Bibcode:1992NucFu..32..143T. doi:10.1088/0029-5515/32/1/i12. ^ Rostoker, N.; Binderbauer, M.; Monkhorst, H. J. (1996-01-01). "Fusion reactors based on colliding beams in a field reversed configuration plasma". ^ Ji, H.; Belova, E.; Gerhardt, S. P.; Yamada, M. (2006-12-01). "Recent Advances in the SPIRIT (Self-organized Plasma with Induction, Reconnection, and Injection Techniques) Concept". Journal of Fusion Energy. 26 (1–2): 93–97. Bibcode:2007JFuE...26...93J. doi:10.1007/s10894-006-9043-4. ISSN 0164-0313. ^ Jones, Ieuan R. (1999-05-01). "A review of rotating magnetic field current drive and the operation of the rotamak as a field-reversed configuration (Rotamak-FRC) and a spherical tokamak (Rotamak-ST)". Physics of Plasmas. 6 (5): 1950–1957. Bibcode:1999PhPl....6.1950J. doi:10.1063/1.873452. ISSN 1070-664X. ^ Glasser, A. H.; Cohen, S. A. (2002-05-01). "Ion and electron acceleration in the field-reversed configuration with an odd-parity rotating magnetic field". Physics of Plasmas. 9 (5): 2093–2102. Bibcode:2002PhPl....9.2093G. doi:10.1063/1.1459456. ISSN 1070-664X. ^ Wang, M. Y.; Miley, G. H. (1979-01-01). "Particle orbits in field-reversed mirrors". Nuclear Fusion. 19 (1): 39. doi:10.1088/0029-5515/19/1/005. ISSN 0029-5515. ^ a b Slough, J. T.; Hoffman, A. L. (1988). "Observation of tilt stability of field reversed configurations at large s". Nuclear Fusion. 28 (6): 1121. doi:10.1088/0029-5515/28/6/016. ^ Asai, T.; Takahashi, T. (2012). "MHD Activity in an Extremely High-Beta Compact Toroid". Topics in Magnetohydrodynamics (PDF). doi:10.5772/37375. ISBN 978-953-51-0211-3. ^ Rostoker, N.; Wessel, F.J.; Rahman, H.U. ; Maglich, B.C. ; Spivey, B. (22 March 1993). "Magnetic Fusion with High Energy Self-Colliding Ion Beams" (Submitted manuscript). Physical Review Letters. 70 (1818): 1818–1821. Bibcode:1993PhRvL..70.1818R. doi:10.1103/PhysRevLett.70.1818. PMID 10053394. ^ Rostoker, N.; Binderbauer, M. W.; Wessel, F. J.; Monkhorst, H. J. Colliding Beam Fusion Reactor (PDF). Invited Paper, Special Session on Advanced Fuels APS-DPP. American Physical Society. Archived from the original (PDF) on 2002-01-26. ^ Gerhardt, S. P.; Belova, E.; Inomoto, M.; Yamada, M.; Ji, H.; Ren, Y.; Kuritsyn, A. (2006). "Equilibrium and stability studies of oblate field-reversed configurations in the Magnetic Reconnection Experiment" (PDF). Physics of Plasmas. 13 (11): 112508. Bibcode:2006PhPl...13k2508G. doi:10.1063/1.2360912. ^ Omelchenko, Yu. A. (27–29 March 2000). Stabilization of the FRC Tilt Mode by a Self-Generated Toroidal Field (PDF). Sherwood 2000 International Fusion/Plasma Theory Conference. UCLA, Los Angeles, California: General Atomics Fusion Energy Research. Archived from the original (PDF) on 2014-12-16. ^ Tuszewski, M. (1984). "Experimental study of the equilibrium of field-reversed configurations". Plasma Physics and Controlled Fusion. 26 (8): 991–1005. Bibcode:1984PPCF...26..991T. doi:10.1088/0741-3335/26/8/004. ^ Ohi, S.; Minato, T.; Kawakami, Y.; Tanjyo, M.; Okada, S.; Ito, Y.; Kako, M.; Gotô, S.; Ishimura, T.; Itô, H. (1983). "Quadrupole Stabilization of the n=2 Rotational Instability of a Field-Reversed Theta-Pinch Plasma". Physical Review Letters. 51 (12): 1042. Bibcode:1983PhRvL..51.1042O. doi:10.1103/PhysRevLett.51.1042. ^ Hoffman, A. L. (1983). "Suppression of the n=2 rotational instability in field-reversed configurations". Physics of Fluids. 26 (6): 1626. Bibcode:1983PhFl...26.1626H. doi:10.1063/1.864298. ^ Guo, H.; Hoffman, A.; Milroy, R.; Miller, K.; Votroubek, G. (2005). "Stabilization of Interchange Modes by Rotating Magnetic Fields". Physical Review Letters. 94 (18): 185001. Bibcode:2005PhRvL..94r5001G. doi:10.1103/PhysRevLett.94.185001. PMID 15904379. ^ Slough, J.; Miller, K. (2000). "Enhanced Confinement and Stability of a Field-Reversed Configuration with Rotating Magnetic Field Current Drive" (PDF). Physical Review Letters. 85 (7): 1444–7. Bibcode:2000PhRvL..85.1444S. doi:10.1103/PhysRevLett.85.1444. PMID 10970525. Archived from the original (PDF) on 2012-10-17. ^ Pancotti, Anthony. "Testimony before the Space Subcommittee of the House Committee on Science, Space, and Technology United States House of Representatives Hearing on In-Space Propulsion: Strategic Choices and Options June 29, 2017" (PDF). Retrieved 8 April 2019. ^ "NASA's NextSTEP Advanced Electric Propulsion Activities" (PDF). NASA. Retrieved 8 April 2019.